Washington, DC, June 25, 2012 - The Washington International Horse Show (WIHS), a leading national equestrian event based in Washington, DC since 1958, is proud to announce Hanna Powers of Potomac Falls, Virginia, as Youth Ambassador of the 2012 show. 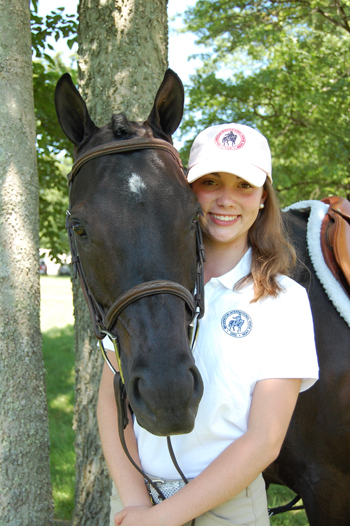 Powers 15, is a sophomore at The Madeira School in McLean Virginia and competes on the varsity Interscholastic Equestrian Association (IEA) team. She has attended WIHS for many years with her friends and family. Powers brings a wealth of knowledge of equestrian sport to her new role. “I am honored to be a part of the WIHS family as the 2012 Youth Ambassador. Through this historic horse show, I hope that our efforts to share the wonderful world of horses with young people in the Washington, DC area, will ignite the imaginations of a whole new generation of horse enthusiasts!” said Powers. As the 2012 WIHS Youth Ambassador, Powers will oversee the WIHS Junior Committee and work with show management to reach out to the local youth of our community. She will help give WIHS a youth perspective as the show develops new and exciting youth-related programs from young rider events to Kids’ Day. The Junior Committee consists of students from public, charter and private schools in Maryland, Virginia and Washington, DC. “We are thrilled to have Hanna's energy and enthusiasm as our 2012 Youth Ambassador. She will lead the activities of our Junior Committee, a diverse and talented group of young local equestrians who have expressed strong interest in hands-on learning about all aspects of WIHS. Our Junior Committee works hard to help us make our horse show a very special event for competitors, spectators and the local community. We are honored to work closely with this group of young equestrians who represent the future of the horse industry in the Washington area,” said Bridget Love Meehan, Executive Director, WIHS. 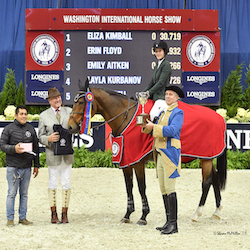 Washington International Horse Show received many applications from very qualified students in the DC Metro area and beyond. Powers will serve as the fourth WIHS Youth Ambassador following Jamal Brown, Anna Rossi and Shannon Miglarese. The 54th annual Washington International Horse Show will be held October 23-28, 2012 at Verizon Center in Washington, DC. Photo: Hannah Powers, 2012 WIHS Youth Ambassador, and Raven.